The Chakra Wisdom Oracle Toolkit guides you in opening up your intuition, removing blockages from your life, improving your relationships and realizing your highest potential. 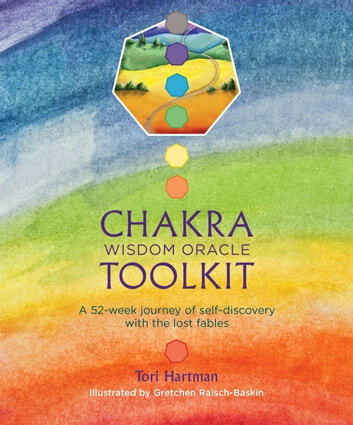 Week by week, you will explore the 49 fables, beginning with “Renewal.” This standalone book can also be used in conjunction with the Chakra Wisdom Oracle Cards. Each fable is associated with one of the major chakras and has its own shade of color. There are five days of activity per week, each requiring just fifteen minutes. On Monday, you read the fable and set your intention for the week. On Tuesday, you explore the meaning of the week’s color. Wednesday is the Journal Journey, when you complete a written task. On Thursday there are exercises in self-understanding, to be done alone or in a group. Friday has a guided meditation. Through short bursts of activity each day, the fables will seep into your life, giving you new perspectives and helping you to make the changes you truly want.